Sean: What is storytelling? Or more specifically, what is storytelling in your words? Andy Goodman: Storytelling is the single most powerful communications tool available to us, period. It is the process of using stories to communicate to people a meaning about how we live in this world. People define “story” differently, but the way I define it — and some people have referred to me as a narrative fundamentalist — is that a story starts with a person who, in some way shape or form, is not content with the status quo. They want to change something, get something, give something, they need to change the status quo in some way, so this sets them off on a journey. Along the way they’re going to run into various barriers and obstacles. How they deal with those barriers or obstacles will reveal things about their character, or the character of their organization. In the end they will either obtain this thing that they were going for, or not, but there will be some change in them or the world as a result of this journey. That journey, hopefully, will have meaning not only for them but for us, the audience, as well. To me that is what a story is all about. Sean: Why is storytelling so important? Andy Goodman: It’s the way we think. We think and live in story. Your typical day is a story with a beginning, middle, and end, with you pursuing objectives and running into barriers and dealing with them and constructing your own meaning out of the day, and over time, out of your life. A typical day for anybody is a story. We all walk around with stories in our heads about the way the world works and we filter everything that happens to us through those stories. Stories are essentially the software of our brain that decides what facts we’re going to let in, that will influence us, and what facts we’ll keep out and that we’ll ignore. I really do believe that it is the most important means of communication we have, the most important tool we have for extracting meaning from daily events and for guiding our lives. Sean: The word “storytelling” is very much in vogue these days. It’s really become a buzzword among a lot of communications pros and some organizations. What do you think that they mean when they come to you and say, “Andy, teach us about storytelling,” or, “We want to transform our organization into a storytelling organization”? What are they trying to achieve by latching onto this phrase? Andy Goodman: Often people come to me, or want to get better at storytelling, because they feel like they’re clear on what they’re doing but for some reason the people they’re working with are not so clear. So they see storytelling as a means to more clearly describe what they do and also help them get better at what they do, help them get better at communicating. A lot of people talk about storytelling but they use it as this all-encompassing term for communicating who we are and what we do when it’s a very specific way of talking about who you are and what you do. Sean: Where are you seeing some success and why do you think that is? 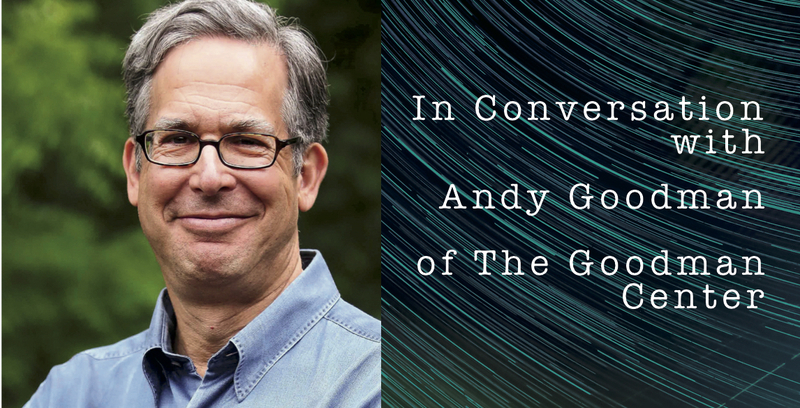 Andy Goodman: I’ve been fortunate to work with a number of organizations who have really embraced storytelling and I think have used it to turbopower what they do. I really started first working in depth with the Environmental Defense Fund, back in the early 2000s. They were the first organization to really embrace this and to make it a part of who they were. They made changes internally and externally as a result of this. I know for example one of the things that came out of it was they said, “From now on every time our program officers show up at a board meeting to address our board and tell them what they’re working on they must start their report with a story. Not just a report of what they’re doing, but tell us a story about something from the field.” Internally it became part of their communications. If you were to look at their website and their reports, et cetera, storytelling became a big part of what they do. Nurse-Family Partnership, an organization that has tremendous data to back up the fact that their nurses, in this home visiting program, are changing the lives of young families and are improving them in measurable ways, an organization that had reams of data to talk about what they do, but were not collecting the stories, these wonderful, personal, emotional stories of these nurses going to work face-to-face with these young mothers and helping their families get off to a stronger, healthier start. They started to collect stories and became a real storytelling culture. If you go to their website, nursefamiliypartnership.org, you’ll just see stories right on the home page, you can’t miss it. Stories are front and center. Sean: I’m going to stipulate that you are not a brain scientist, but my guess is that you spent a little bit of time looking at the research out there that tells us why stories are so effective. What actually happens to a person when they hear a story? Andy Goodman: I will have to defer to the brain scientist here, and there are people like Lisa Cron, who has written an excellent book called “Wired For Story” that really talks about the way our minds work. There are neurochemicals that are stimulated by story, and our minds really do respond to story. We filter through stories all the information coming in. You see this again and again, you see examples where, particularly in politics, people seem to be ignoring certain data, certain things that are true, because they have a story in their brain about the way the world works and they’re sticking with it. You look at the people who support Donald Trump who just seem to be willing to ignore lots of data, lots of facts about his leadership and where he’s taking the country, because they have a story in their brain that works about why they like Donald Trump and they’re going to stick with that story. That has nothing to do with chemicals in the brain, it has everything to do with how stories become filters, essentially, and software that run our brains. Sean: Surely you’ve seen some challenges and places where folks are struggling. Why do you think that happens? Why is it so difficult to take an organization and turn it into a storytelling organization, create that culture of storytelling? Andy Goodman: What makes stories good, what makes stories interesting and compelling, are the problems, the barriers, the obstacles, the things that go wrong along the way to success. When nonprofits tell stories, when foundations tell stories, they are reluctant to acknowledge that part of the story. The thing I like to say is I have heard thousands of nonprofit stories, literally thousands of nonprofit stories, over the last 15 years. Here’s every nonprofit story ever told in 30 seconds: “People were in pain. We launched this program to help them. They’re better now. Give me money.” That’s every nonprofit story ever told. What that leaves out is that on their way to trying to solve the problem not everything goes so smoothly, often there are wrong turns, there are dead ends, there are outright mistakes. That’s what makes stories interesting. When someone tells you a story, the moment you lean forward is when something happens that you don’t expect, something unusual. If you just tell success stories left and right, then after a while they’re boring. Nothing interesting ever happens, nothing surprising ever happens, and they become cliches. One of the great failings for nonprofits and foundations and other good causes is that they want to tell stories where they encounter people with problems or challenges, they bring their solutions, these people are helped and the world is a better place. Even if that’s essentially true, that doesn’t make for an interesting story. Not a story that people will remember, be moved by, be engaged by. I think the number one challenge is failing to understand that stories become interesting when things go wrong. Another major challenge is that stories are always about people. For me to identify with a story, for you to identify with a story, you’ve got to give us somebody up front who we can meet and care about and say, “Okay, this Sean guy is interesting, I’m going to follow him, I want to see if he gets where he’s going.” Because of either modesty or whatever reasons some organizations are reluctant to identify anybody in a story. As a result it becomes about an abstract person or a group of people or a large entity and it prohibits us from identifying with that person. If you don’t identify with someone in the story then the story is progressing and you’re just watching from the sidelines and you’re not really engaged. Failing to give us someone to attach to at the beginning is another major failing in storytelling by these organizations that we work with. That said, I’m not talking about protecting privacy or confidentiality, I certainly understand that. You can still tell a story about a person and use a pseudonym or create a composite character, whatever, to use the power of narrative to convey what you’re saying. They even fail to do that sometimes as well. Sean: Let’s say you and I wanted to tell a story. What would be the ingredients, what are the key components, the how’s and why’s? Andy Goodman: Paul Slovic has done really authoritative work on compassion, why people care and why people don’t care, and empathy. He’s based at the University of Oregon. He’s done absolutely definitive research on empathy. One of the things he finds is that people can empathize and identify with a single person. The minute it goes from one to two empathy drops significantly. What he’s most known for his research is, for example, when the genocides were happening in Rwanda and people were told that 400,000 people had died and then they were told, “Oh no, wait, it’s 500,000,” it didn’t affect them. The numbers were so large that the empathy level barely shifted at all, people just can’t relate to those big numbers. He wanted to find out what point does empathy start to decrease? Believe it or not it starts from one to two. Once you get to two people it’s harder to care than it is to care about one person. Hold onto that thought and now let’s go into the world of storytelling. If you’re going to tell a story you’ve got to start with one person because people can understand that, they can relate to it, they can engage with an individual and say, “Okay, this is the story of Sean, I will follow him.” The minute it’s about two people, five people, a team, a group, a city, whatever, then it becomes impossible to identify. That is the first necessary condition, who are we starting the story with? What can you tell me about them that makes me identify, care, empathize? Not pity but empathize with. Once I know who that person is, what is it that they want? What is it that they seek? Why should I care about it? Do I care about the goal? Is it something that’s important to me too? Or do I just like that person enough that regardless of the goal I want to see them succeed? What pulls me to the story? If you can satisfy that condition, now we’re into the story and we’re following this person on their journey. Then the next question is what happens along the way that keeps me interested, that I don’t expect, that makes me lean forward and go, “Oh wow, didn’t see that coming, then what happened?” What are these unexpected moments along the way? If the story is completely predictable and I know what’s going to happen from the beginning, then, again, I’m not interested and you’ve lost me. What are the barriers and obstacles? Once they overcome those barriers where do they end up? What is the ending? What happens and what does it mean? What does it mean to them, and what meaning do I extract from it that helps me understand my life better or the work that I’m doing? I think I’ve just given you all the essential elements of story from beginning to end: protagonist, goal, barriers, how those barriers are overcome, resolution, and meaning. Sean: What are a few of the things an organization that wants to tell stories needs to do before they pick up the phone and call you? What are the assets they need to bring together to start moving themselves in the right direction? Andy Goodman: If you want to be a storytelling culture there are certain conditions I think need to be in place. Number one, the CEO, the top person, has got to believe. If you don’t have belief from the top down then the people who are carrying out storytelling will ultimately run into management that doesn’t sufficiently value storytelling. You have to have management in place that says, “This is important.” For larger organizations there then has to be a level of middle management or lieutenants that say, “We will carry this mandate forward and make sure that everyone is involved and everyone follows up, because there’s work to be done here.” There has to be people who keep an eye on this. Once you have those attitudes in place then you have to start building in the system. You have to create a demand for storytelling. It’s not just going to happen, you have to actually go out and get the stories. You have to say, “All right, from now on our website is going to feature stories on a regular basis. Our monthly newsletter is going to have stories. Our internal staff and board meetings will feature stories. There’s a demand. We need to fill these slots with stories, so now you need to go out and get them.” Then your people have to be trained in how to actually go out and get them, how to extract the stories from the people that they’re working with in the field, the people that they serve, et cetera, they have to know how to do that. Sean: When it comes to the C suite, the magic word is impact. What does impact look like when it comes to storytelling? Andy Goodman: I often get that question, “What’s the ROI of storytelling?” It’s hard to measure sometimes because if I said to you, “I’m going to come into your organization and do a leadership training and I’m going to make your C suite people better leaders.” Let’s say I do the training and people feel that it was great and inspiring and they become better leaders. How do you measure the impact of that leadership training? Does the organization serve more people? Does it raise more money? Is their morale happier internally? Maybe some of those things, maybe all of those things. It’s a hard thing to measure sometimes because leadership is so diffuse. You know when it’s good and you know when it’s bad. It’s a little hard to measure. Sean: If someone was going to call you up and say, “Andy, I need you to come in. We really are looking to transform our organization, we know we need to get better at this,” what’s the first question you hope to hear out of their mouths ? Andy Goodman: I guess it’s … I think that if organizations are willing to say, “How do we tell good stories,” that’s what I want to hear because often when I go in I have to take them back to square one and say, “You say you’re telling stories on your website, you have this page called success stories, but they’re not stories.” I have to do some unlearning to say, “These things that you call stories? They’re not really stories. They’re pictures, they’re captions, they’re slideshows, they’re bullets, but they’re not really stories and we’ve got to go back to square one.” If they can start by saying, “How do we tell a good story?” Then there’s an openness there to start where we need to start, and that’s really what I hope to hear. When I started really working on storytelling in the early 2000s I was getting a lot of why, why is this important, why do we need this. Not so much anymore. I think the why’s have gone away. I think organizations realize that storytelling is a critical skill. I think you put your finger on it there, we have moved from “why” to “how”. The more I hear “how”, the happier I am. Andy Goodman: I like to say that I am a graduate of the Walt Disney/Jim Henson School of Storytelling. I moved to Los Angeles in 1991 to be a television writer and the first TV show I worked on was a show called “Dinosaurs” that ran from 1991 to 1994. That show was a Walt Disney/Jim Henson co-production. My mentors on that show were from both sides of those two great families bringing their knowledge of storytelling. The Disneys, the Hensons, the Pixars, I think those are master storytellers. If you study their work you could do worse. Also when I first came out here, was an aspiring writer, I took one of the classes by Robert McKee, a legendary guru of storytelling out here, he teaches screenwriting classes in New York, Chicago, LA. I took his three day course here and then I bought his book, which is called “Story”. If you ever saw the movie “Adaptation” with Nicholas Cage there’s a scene in which he goes to a McKee seminar. McKee is just legendary out here. When I went to McKee’s class here, it was at UCLA, there were about 400 people in the audience, and one row in front of me was David Bowie. Everybody goes. McKee is really considered the guru. It’s also interesting because he’s a guy who tried to write screenplays and failed, so it’s like someone who can teach it brilliantly but couldn’t do it. His book “Story” is the culmination of his work, it’s a big, thick book. It’s primarily targeted at people who are aspiring screenwriters and TV writers but if you want to understand story, the opening chapter on story structure, to me, is definitive. Then for enjoyment I like to read lots of popular fiction. I just read Tom Perrotta’s new novel “Mrs. Fletcher,” which is terrific. I just try and read and watch good storytelling, stuff that you see on Netflix and the books that are best sellers, that’s what are on my bedside table.